Medellín (pronounced IPA: [mɛdəˈjiːn] or [mɛdəˈliːn], Spanish: [með̞eˈʝin] or [með̞eˈʎin]) is the capital city in the Metropolitan Area of Medellín of the Antioquia Department, Colombia. It was founded in 1616 by Francisco Herrera Campuzano. As of 2014, the municipality of Medellín had a population of about 2.45 million inhabitants. This makes it the second most populated city in Colombia after Bogotá, which is the capital city of Colombia. Medellín also is the core of the Valle de Aburrá (Aburrá Valley) metropolitan area. This is the second largest metropolitan area in Colombia, with more than 3.8 million inhabitants, and a leading and productive industrial and urban center. The city's major problem is unemployment. Many other Colombian cities also have this problem. 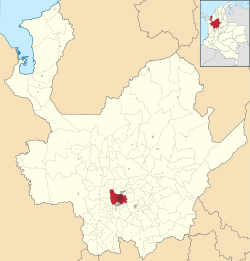 People from Antioquia and especially from Medellín are called Paisas although the Paisas are people from the departments of Antioquia, Risaralda, Caldas and Quindío. ↑ Helders, Stefan. "World Gazetteer: Colombia: largest cities: calc 2006". Archived from the original on 2007-10-01. Retrieved 2006-06-15. ↑ Butler, Rhett (2003). "Largest cities in Colombia (2002)". Retrieved 2006-06-15. This page was last changed on 20 September 2018, at 21:57.